Jamie Vardy was Leicester’s hero last weekend as his hat-trick inspired the Foxes to a 4-2 win over Manchester City. He’s in the bad books now though, after being shown a straight red card for this two-footed lunge against Stoke. 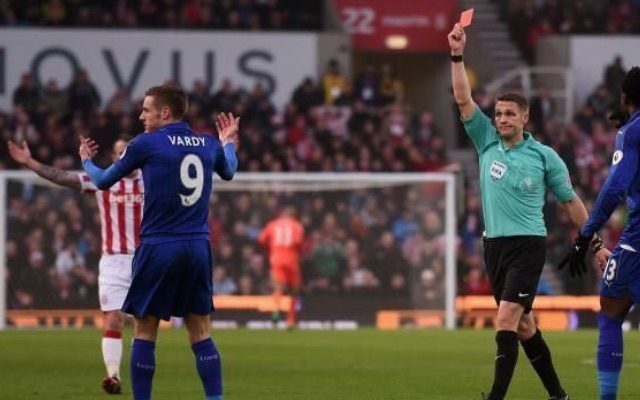 Vardy was dismissed inside the first 30 minutes of Leicester’s clash with the Potters. Although he clearly played the ball, by leaping in with both feet in midair the 28-year-old was reckless and his tackle could have been dangerous. Barring an unlikely appeal, Vardy will now serve a three-game ban, which will see him miss games against Everton, West Ham and Middlesbrough. On the bright side, with no game until January 7 for the bad lad, Vardy can now afford to go a little harder at Christmas this year.